and there are bees buzzing all around. I didn't make a note of which textures I used this time, but I'm pretty sure one of them was my new favorite, broken book. I've also been liking mixed media and moody lately too. I created a button today for a new blog link up that I'm going to be hosting each Thursday. You can check it out under This or That Thursday in my menu bar (and the button is right over there in my sidebar). There are no themes for this hop so you can choose any photo you'd like! I hope you'll come back on Thursday and link up a photo! These are such beautiful shots and I love your texture work. i miss my sage bushes. they died out a few years back in a mild drought we were having (and i didn't water them enough!) they'd have never made it thru this year though! Gorgeous! I always want to get good photos when my sage blooms, but all the bees chase me away! I noticed them the other day on the way home. Beautiful shots. Love the texture. The textures on these are so wonderful! I could just sit and watch bees all day - everything about them is just fascinating!! Whòw they are so pretty! 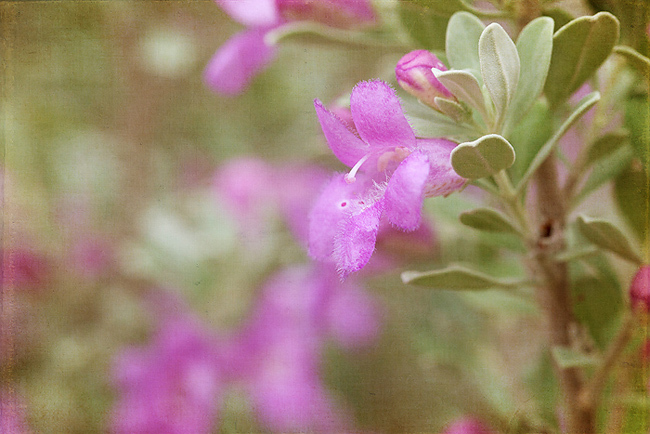 Lovely pictures of a pretty flower, love what you have done with them. I don't think I've ever seen sage. It's really beautiful! Love the textures you used here! Especially love the bee. Love the textures! I'll be back Thursday for the link-up! Yay! You're hosting a link up! How fun! Oh and I love your shots today! They are lovely! I finally remembered to pick some of my sage to dry. No blooms now, but it still smell heavenly. LOVE the texture! They are great! And the muted colors too! 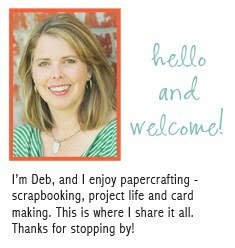 Love seeing you play with textures more- beautiful Deb! Love that bee shot, and love the textures you used! As always...most excellent! Beautiful texture work...and I love how you "captured" the bee! beautiful photos - like the added textures! Gorgeous, I love the first capture! Such pretty images and texture work. 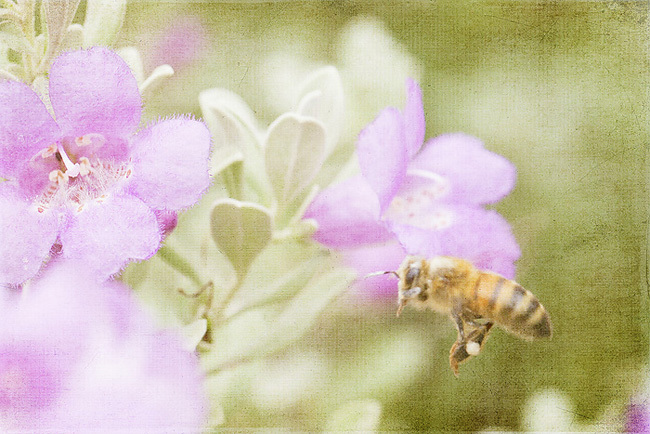 Wow, Deb, I love these images, and especially the bee capture! You have an unerring eye! Loved reading your profile (from your 9/18 post) -- it's nice to learn more about you. OMGoodness. These feel so soft & light. (hope that makes sense?!! )The bee shot is just perfect.I love snapping shots of my neighbors flowers too! These have such a wonderful soft feel. I just love your work! These are gorgeous! Works of art! Love the texture. That sage plant is stunning! Makes me think of one of my favorite winter soups that has tons of sage in it! Really lovely and I love the bee!! I'll be stopping by on Thursday too, looking forward to it! That second shot is sooo dreamy - beautiful photos! Beautiful photos and texture!! !I'm so happy to "meet" you, my newest blog follower! beautiful shots! i love the purple color. Such fabulous shots. The flower has a very beautiful colour. Beautiful photos! Love your blog! Thanks so much for your comment! Beautiful pictures, I love the second one. What a great capture of the bee; I can see his pollen sack. I love the sage, sooooo beautiful. I think sage has one of the most beautiful tones of green. Lovely. cool close-up of the flying bee! Excellent color! Excellent composition! Excellent enhancement of the photo thru the use of texture. Well done!